Nutrients are compounds found in different foods that allow us to live and grow. 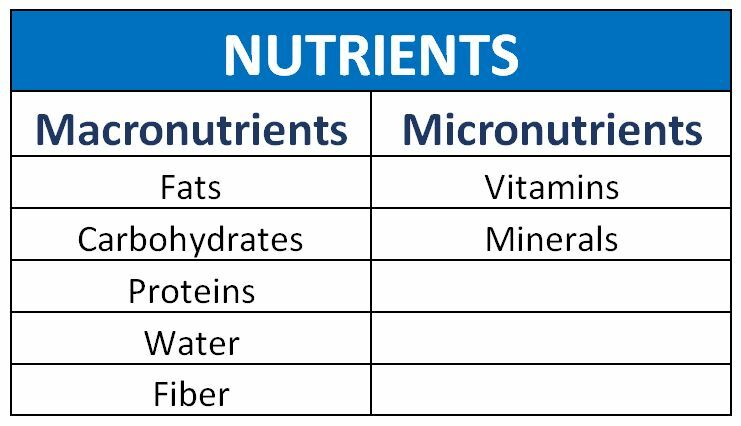 Nutrients can be broken down into 2 different categories; Macronutrients (large) and Micronutrients (small). Micronutrients are found within Macronutrients. The more Micronutrients in a Macronutrient, generally, the better it is for you. One food item may contain multiple macronutrients and several micronutrients. Take an apple for example; it contains macronutrients such as carbohydrates, fiber, water, and micronutrients such as Potassium, Calcium, Phosphorus, Vitamins A, and Vitamin C. A balanced meal will contain all of the macronutrients, and different levels of micronutrients depending on what foods you have chosen to eat. Many commercially manufactured foods are so low in micronutrients and fiber that they have to artificially add them back into the foods. Vitamins and minerals created in labs are not as easily absorbed by the body as those naturally grown within foods. To get the most micronutrient dense foods, it is best to stick with fresh fruits, vegetables, meats, and dairy.